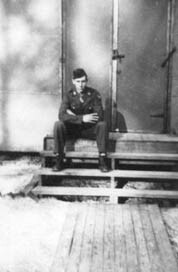 It was at Davis Monthon Field that the crew was assembled in June of 1943. Kellis' sister sent him a large sheet coconut cake packed in popcorn for his birthday July 17, 1921. Their original operator was a short, heavy, good natured man by the name of Strabinski. He was a good man but got air sick as soon as the plane left the runway. Countless barf bags were held for him and later thrown out of the plane. He was replaced by Bob Meads. While at Tucson they checked out copilots. They did touch and go landings, power off and on stalls, etc. It was a lot of work for John, Bernie, Harold and Bob. The rest of the crew took turns helping out. Charles spent a lot of time helping Bill Miller with his practice booming. He needed someone to move the "bug" or target around the hanger. Harold stood out from the start. They knew they had a good airman. According to Charles Kellis, he and Joe were "a little too rowdy for Harold. But he went along and never said much." 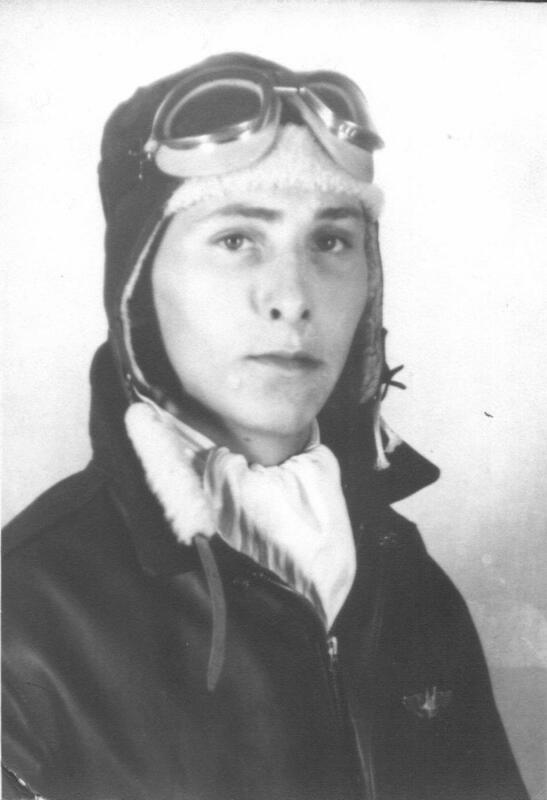 One of Harold's jobs was to come on the intercom and tell the rest of the crew when they reached 10,000 feet so they would know when to put on their oxygen. Dad had grown up in West Virginia and had a bit of an accent. Apparently Dad pronounced oxygen, "oggen". Every time he came on and said "Crew chief to crew. We are going through 10,000 feet. Go on oggen" someone in the crew would answer him back "say again". So he would repeat the message the same way. They all laughed and he never seemed to catch on. 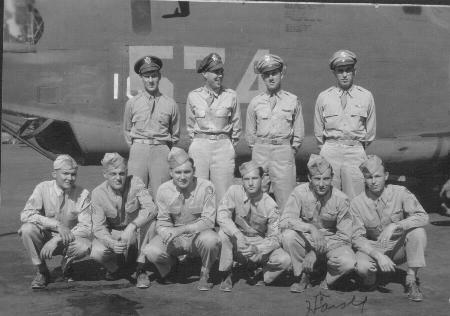 This picture was taken of crew 50 of the 460th beside B-24H-1 DT 41-28574. This was the very first B-24H assembled by Douglas at Tulsa from a knock down kit produced by Ford at Willow Run, MI. Following on from earlier B-24E assembly, it had constructor's number 166. The 1 and part of the first 6 can be seen. The last 6 has been painted over with last three figures of the serial number. It was made available to the USAAF in September 1943. The bold last three figures of the serial number painted on the nose are a sure sign that it was assigned to a training unit in the US. They trained for 3 months and then went to Grand Island, NE. From there they went on a train to Fort Dix, NJ. They stayed there for about two weeks before they boarded the Queen Mary then known as the Gray Ghost. 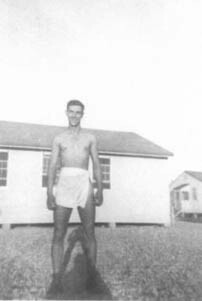 There were a total of ten crews to be assigned to the 389th that went over on that voyage. All in all there were around 20,000 troupes on board at that time from all branches of the service. It took a couple of days to unload the ship. They went to Firth of Clyde where England and Scotland come together on the west coast of Scotland. That is where the 389th bomb crew was. They arrived around December 1, 1943. They were assigned to a couple of staging stations and then went to Hethel. 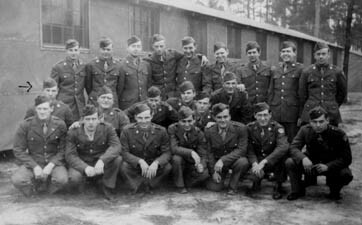 They arrived in Norwich February 1, 1944. 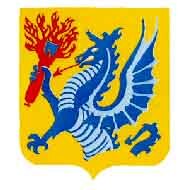 460th BG was composed of four squadrons (760th, 761st, 762nd and 763rd) and was based at Spinazzola, Italy, as part of 55th Combat Wing, which was assigned to the 15th AF. Crew #50 would tend to point to the squadron being the 761st. 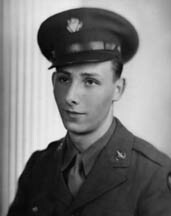 The group was deployed to Italy in Jan or Feb 44 - about the same time as my father, Harold Rhodes' crew arrived in England. 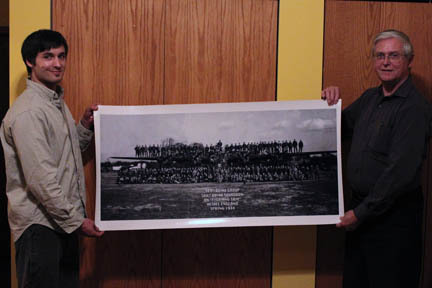 1/14/2010 Rodney Kellis sent me a 2x4’ picture of the 389th BS. He also sent a 1x2’ one to give to my Mom. I called and thanked him. He is doing good. Goes to the Y 3 times a “day”, I think he meant week. He had a heart valve replace a couple of years ago and he said that took care of a lot of his health problems – “perked right up after that”. He said he does get pneumonia every now and then and ends up back in the hospital but they get rid of that for him. I asked where and how he got this picture so large. He said that a friend of his works at a place where they investigate accidents and build equipment to keep people safe. This guy is a professional and has the equipment or access to it to do something like this. He had asked him if he could enlarge the section where Dad’s crew was at and when he got it, he had enlarged the entire thing. He has a copy framed and hanging in his living room, takes up most of the entire wall. He got the picture after his mother died. They were going through all of her stuff and found it. He thought she had said that the military sent it to her or maybe he did. He didn’t remember sending it. He figures the military sent it back to her along with the rest of his personal belongings while they were in termed in Sweden. It was a 9x12 according to him but I’m sure it was an 8 x 10. I think I have the same picture setting on Mom’s desk at the office. Each of the guys must have gotten one. He said that Dad has a sheep skin flight jacket on and next to him is Forsyth and Sawyer. All of the crew are together. He said he is off to the side and all you can see is his head or face. I will need to check that out and see if I can find them and identify who is who. I will try to do so with the digital copy that I have at the top of this page. This one came from my computer something like DadsWeb/srhodes/tribute files. There is this larger file there as well as a smaller version of it which must be the one I used on the site? He said he thought that the larger one actually turned out better than the smaller one. This came from Doug Sheley just minutes after I put the picture of Ked and me holding the picture. 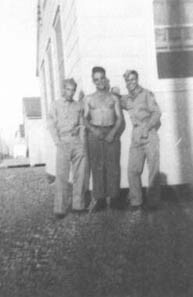 The plane that they are posing with is "Fighting Sam" a B-24D-65-CO Liberator (s/n 42-40506) from the 566th Bomb Squadron, 389th Bomb Group, 8th Air Force. 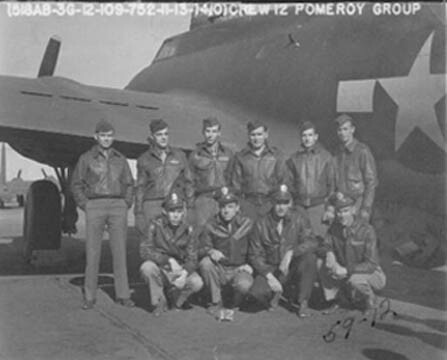 The plane was transferred around the time this photo was taken (March 5, 1944) to the 801st Bomb Group which shared everything with the 492nd Bomb Group because it was the cover for the 801st's Top Secret operations. "Fighting Sam" was modified for use in so called "Carpetbagger" missions to drop spies, supplies and leaflets behind the lines in Europe. Possibly, they were originally scheduled to go to Italy as an original 460th BG crew but ended up being assigned to the 8th AF in England as a replacement crew. Losses were very heavy at that time and the 8th AF had a desperate need for replacement aircraft and crews. "A coward dies a thousand deaths. 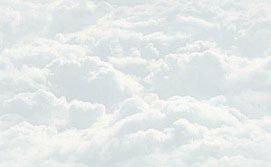 The brave die but once." Somewhere around the third mission, Miller, the bombardier and Moore, the nose gunner, "turned chicken" and quit. 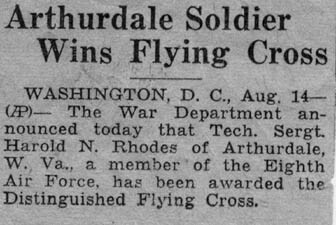 Those who flew did so because they volunteered to do so. Therefore if volunteering to fly was an option, so was quitting. The men and all of their belongings were immediately removed and never spoken of again. They did not want their influence on any of the rest of the "fly boys." Prueher asked to take over the responsibilities of Miller. He didn't mind the extra work and the "extra space" in the plane was welcome. 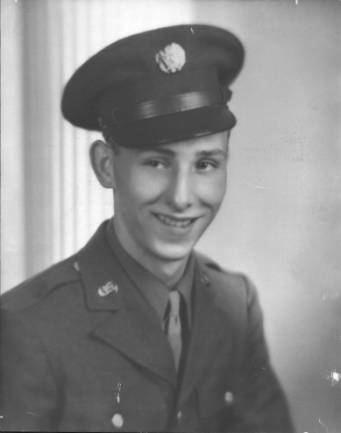 Prueher had gone to bomb school and from there on to navigation school so he knew both jobs. Prueher recalls, "When he (Miller) did his work, I had to crawl out of the way. In fact I'm better at it than he is." The crew that was left refereed to themselves as "The Basic 8". Everybody wanted to quit. When asked if he was ever scared, John Forsyth answered, "No. I was never scared. Terrorized YES! Scared is too sissy of a word." By definition, courage is not the lack of fear but proper action in spite of it. The eight that continued to work together as a team were not men without fear but men who did what they needed to do in spite of it. That is what makes a man a hero. "The Mighty Eighty, written by Gerald Astor in 1997 and published by Bantam Books, is the definitive story of the 8th Air Force's World War II experience (not to be confused with Roger Freeman's earlier Mighty Eighth, published in 1970). Stephen Ambrose in Citizen Soldiers refers to the oral histories in Astor's book as the best description of the air war extant. There were 350,000 Army Air Force airmen who served with the Eighth Air Force in England. Of these, 26,000 were killed or 7.42%. Compare this number to the percentages of the other branches - the Marines 3.29%, the Army 2.25%, and the Nave .41%. By restricting the mortality rate to the 210,000 air crewmen the rate soars to 12.38%. 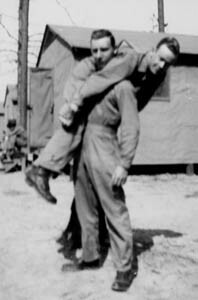 In addition, 21,000 from the 8th wound up on POW camps. 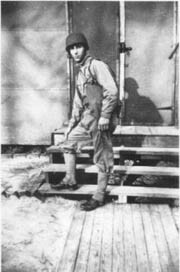 A typical bomber lasted only 147 days in combat. The 8th lost 6,537 B-17s and B-24s, and another 3,337 fighters. The scope of the wartime Eighth Air Force staggers the imagination even today." The Journal Official Publication of the Second Air Division Assn. To go back to childhood years. Home To go to the crew put together.